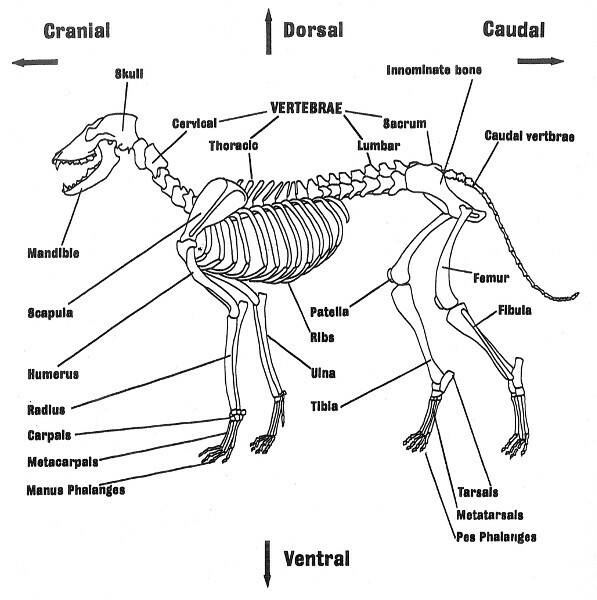 This diagram of a domestic dog skeleton provides the names of the bones. It was taken from a manual on bone identification (Mammal Bones and Teeth: An Introduction to Methods of Identification, Institute of Archaeology, University College London, 1992 and 1995) and is used with the permission of the author, Simon Hillson. Zooarchaeologists identify and record the names of the bone elements (body parts) as precisely as possible. You are probably familiar with some of the names of bones in the human body, such as the humerus, radius, and ulna in the arm. Humans are mammals and other mammals such as dogs have the same bones, and many have the same names. Diagrams such as the one of the dog skeleton may be used to help a zooarchaeologist identify the names of bone element from archaeological sites. The names of the bones for some of the skeletons in the Illinois State Museum comparative collection are labeled directly on the bones. 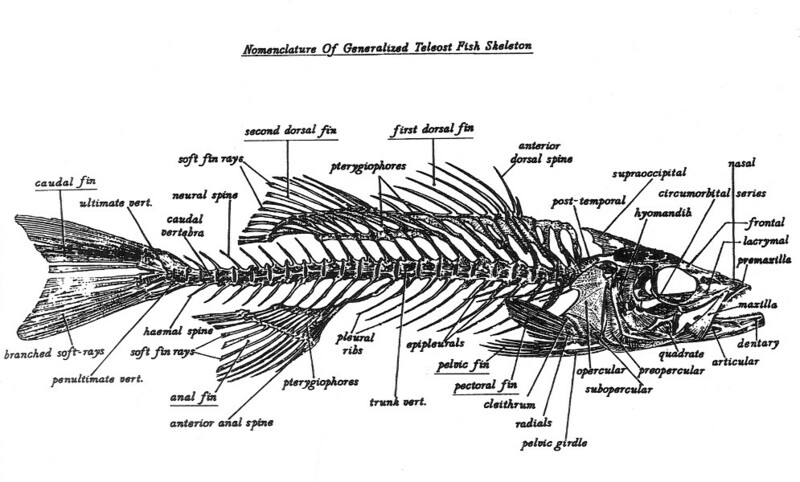 As this diagram of a fish skeleton shows, many of the names of fish bones differ from those of mammals. This diagram comes from an identification manual (Fish, Amphibian and Reptile Remains from Archaeological Sites, Part 1, Papers of the Peabody Museum of Archaeology and Ethnology, Vol 56, No. 1, Harvard University Press, 1968) prepared by zooarchaeologist Stanley Olson. The names of bones for other classes of animals such as birds, reptiles, amphibians, and fish are often different so it is important to have good comparative specimens and other reference materials to help you learn the names of the bones. Figuring out which body parts are present helps us determine if a particular species of animal is represented only by a few parts of the body or if most of the skeleton is present. It may also help you determine if the whole animal or select cuts of meat were carried to the camp. We use this articulated skeleton of a Greater Prairie Chicken in the ISM's comparative collection to help us describe the portions for bird bones recovered at archaeological sites. It helps us see what the orientation of the bones would be in a living animal. Image taken by Doug Carr. We also record the portion of the element that is present. It helps to have articulated skeletons, such as the Greater Prairie Chicken (Tympanuchus cupido) skeleton to the left, or good drawings to help figure out the orientations of the bones in the skeleton and what portion we have. We describe portions of bones from archaeological sites with terms such as proximal, distal, shaft or mid-section, anterior, posterior, dorsal, ventral, and indeterminate. You may have noticied that we capitalized the first letter for the common name of the Greater Prairie Chicken. Ornithologists (scientists who study birds) usually capitalize the common names of birds. Scientists usually don't capitaltize the first letter of the common names for other classes of animals unless they include a proper name. Match the Wild Turkey tibiotarsus fragment from Modoc Rock Shelter (left side of image) to the turkey tibiotarsus from the comparative collection (right side of image). Find the same bone in the image of the articulated skeleton of the Greater Prairie Chicken, and determine if the part you have is proximal or distal. Image taken by Bonnie Styles. See if you can match this fragment from a Wild Turkey (Meleagris gallopavo) bone from Modoc Rock Shelter to the correct portion of the whole turkey bone from the comparative collection. 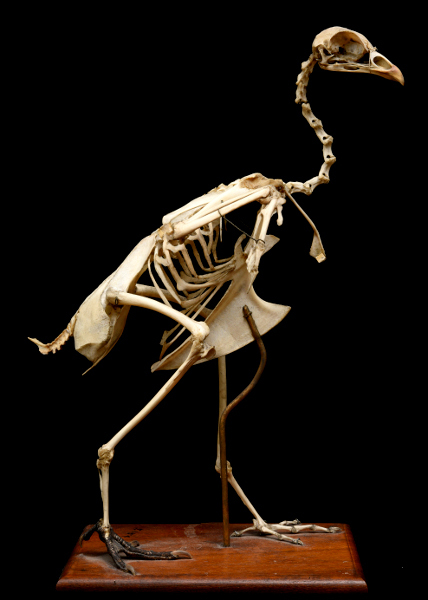 See if you can find the same bone on the image of the articulated Greater Prairie Chicken (Tympanuchus cupido) skeleton. The turkey is in the same family (Phasianidae) as the prairie chicken. Even though the turkey is much larger, the bones are similar in shape. The bone you are trying to match is called a tibiotarsus. The upper part of this bone is called the proximal portion. The lower part at the bottom of the long shaft is called the distal end. Which portion is present on the bone from Modoc Rock Shelter? Is a tibiotarus in the leg or wing of the turkey? Determine if the Wild Turkey tibiotarsus from Modoc Rock Shelter (left side of image) matches the turkey left tibiotarsus (center of image) or the right tibiotarsus (right side of image) from the comparative collection. Image taken by Bonnie Styles. If the body part is paired in the body as is the case for arm and leg bones, then we also determine whether we have a right or left. If the bone is not paired in the body as is the case for vertebra, then there is no right or left. Determining portions and rights and lefts are important in counting how many bones and individual animals are represented in your sample. See if you can match the Wild Turkey tibiotarsus fragment from Modoc to the left or right bone from the comparative collection. Match the eastern box turtle hypoplastron to the right or left side of the eastern box turtle plastron from the comparative collection. Image taken by Bonnie Styles. Now see if you can match the fragment of eastern box turtle shell from Modoc to the right or left side of the plastron (lower shell) from the eastern box turtle from the comparative collection. The bone from Modoc is called a hypoplastron. It is in the back or posterior half of the plastron. Match the channel catfish preopercle from Modoc Rock Shelter (bottom of image) to the left (top, left of image) or right (top, right of image) from a channel catfish from the comparative collection. Image taken by Bonnie Styles. Let's try one more. This channel catfish (Ictalurus punctatus) bone from Modoc is a preopercle, a paired bone in the skull of a fish. The whole bone is not present. The left and right preopercles from a channel catfish in the comparative collection are positioned above the archaeological specimen. What side is the bone from Modoc? We record whether not the whole bone is present. Some zooarchaeologists only record whether the bone is a fragment or whole. Others record the completeness in halves or quarters. Describing breakage helps us understand the quality of preservation and how bones were processed for food and raw material. More precise coding of completeness gives us a better sense of breakage than simply noting if bones are fragments or whole. At Koster and Modoc, most bones were broken into small fragments. We think that people broke the deer bones with marrow into small pieces to extract the nutritious marrow. The bone on the left in the image is a white-tailed deer metacarpal from Modoc Rock Shelter. The bone on the right in the image is a whole deer metacarpal from the comparative collection. How would you describe the completeness of the bone from Modoc? Image taken by Bonnie Styles. The bone on the left of the image is a right metacarpal (a bone in the lower part of the front leg) from a white-tailed deer (Odocoileus virginianus) from Modoc Rock Shelter. The bone on the right is a deer right metacarpal from the comparative collection. Look at the image and see if you can describe the completeness of the metacarpal from Modoc compared to the whole specimen from the comparative collection. We coded the completeness for this bone as greater than 1/4 but less than or equal to 1/2 present. We also note whether the bone from the archaeological site was broken long ago or whether the break is recent. Archaeologists sometimes break bones when they are digging, and sometimes fragile bones simply fall apart when they are handled. The color of the bone along recent and old breaks usually differs. The bone from Modoc has an old break. It would have contained marrow, and Archaic Period people may have been broken it to extract that marrow.